The United States watches nervously as Europe and Asia are consumed by warfare. President Franklin Roosevelt finishes his second term. No other president has ever won a third term, but Roosevelt has no obvious successor. Meanwhile, the Republicans, buoyed by gains in the 1938 midterm elections, must decide between nominating an old party hand or a newer, more dynamic candidate. Who will serve as Commander-in-Chief as the crisis grows? President Franklin Roosevelt (undecided)—remove Roosevelt for a truly wide-open scenario! It’s 1940, and World War II is raging in the Eastern Hemisphere. Should America join in the fight to stop Germany? FDR was so popular that arguably the lead point of attacking FDR for Republicans was to convince Americans that the two-term limit (which didn’t exist at the time) was an unofficial precedent set by George Washington and should be followed. The Republicans were heavily divided between liberal Republicans and conservatives Republicans. The front runners were Thomas Dewey (the leader of the moderate Eastern establishment) and Robert Taft (son of former president Taft and leader of the conservatives). The party eventually settled for the dark horse candidate, Wendell Wilkie, a former Democrat and businessman with no political experience. Other notable Republican candidates in the running include Arthur Vandenberg, who was one of the most powerful senators at the time, and former president Herbert Hoover. Many other candidates for the party also ran. For the Democrats, FDR could have run virtually unopposed, but he didn’t announce that he would run until much later than when candidates usually make their announcement. This upset some of FDR’s critics, including his own VP, John Nance Garner, who would run against him and his New Deal. James Farley, FDR’s campaign manager in 1932 and 1936, thought that the presidency was rightfully his, assuming that FDR and he had intimated that he would serve the regular two-terms and then support his candidacy for office. Farley decided to launch his campaign anyway. Millard Tydings was a candidate non-Southerners opposed to FDR’s New Deal. The Socialist Party was once again the largest 3rd party. 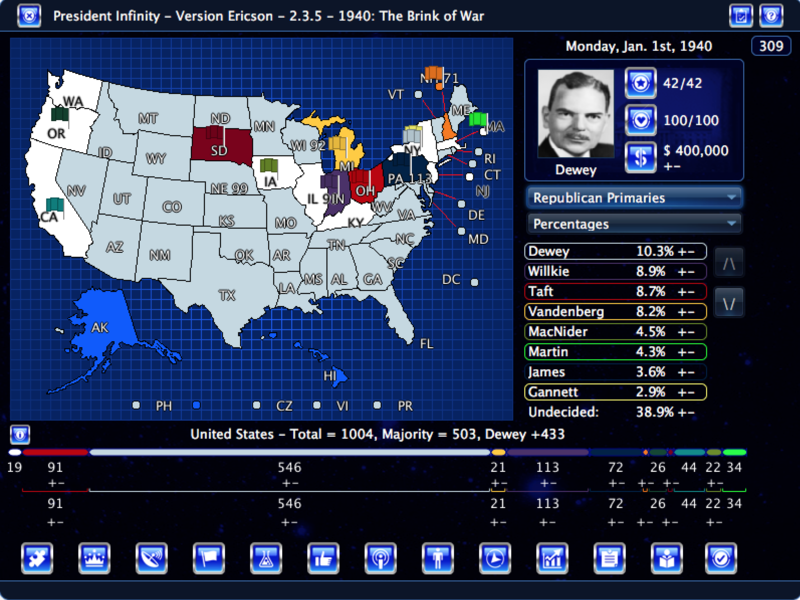 What if the Republican nominee from 1936, Alf Landon, ran again? William Borah, the progressive Republican icon, was expected to make a run, but he suddenly died. What if he had not? Many wanted Teddy Roosevelt Jr to run against his distant cousin. What if he had? Many conservative Republicans wanted John Bricker to run. What if he had? Fiorello LaGuardia was arguably the most popular mayor in the history of New York City. He was a supporter of much of FDR’s New Deal policies. Could he have won over independents to his side? Some wanted Henry Cabot Lodge Jr, the grandson of one of the most powerful Republican Senators, to run for the presidency. FDR’s Secretary of War, was a war hawk and a Republican. What if he had bolted from the cabinet to be the pro-war Republican nominee? Some tried to push FDR’s Secretary of State, Cordell Hull, to run against FDR. What if he had? Huey P. Long was assassinated in 1935, but he had plans to run in either 1936 or 1940 or both elections on his Share Our Wealth platform, which claimed the New Deal did not go far enough. What if was not assassinated?